My daughter is very creative and has always loved to play house with her little people or babies. This will come as no surprise how excited she was when she found out she was getting a new Baby Alive! We got the opportunity to review Baby Alive - My Baby Alive. If you have never heard of Baby Alive you will want to keep reading as I also didn't realize how long the Baby Alive dolls have been around. After digging up some information on these dolls I found out that they were originally made by a company called Kenner in 1973! 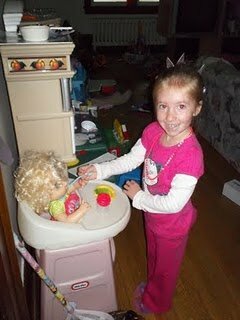 This first baby was a none talking baby that a little girl could feed and push a lever on the dolls back for the food to move through the baby. In 2006 Hasbro redesigned Baby Alive with a more realistic doll that talks, eats and uses a diaper. I remember having one in the early '90's when they first started the talking baby. 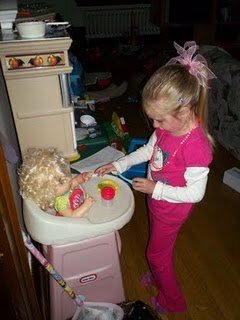 These little baby dolls are very life like and little girls can really feel like they are the babies mom, feeding, and changing baby. The My Baby Alive comes with two packets of food which you mix with a little bit of water, a bib, bottle spoon, bowl and 2 diapers. If you would like more diapers or food accessory packs are available to purchase separately. She can speak 30 different phases when in play mode. Don't forget to switch the button on the back from demo to play or you daughter wont hear all the phases. Where to Buy: You can find a place to buy Baby Alive by visiting Hasbro.ca. Retails at Toys R Us Canada for $39.99 and accessory packs for $6.99. Our thoughts: This little baby doll has been loved by A since she arrived on our door stop. I believe it is how interacted the baby is with A. A will hug and kiss her, play with her when baby asks and also if baby says she is hungry or thirsty A feeds her. The food is easy to mix with the help of an adult. Only thing I wish was different was the diapers. I wish they would have ones that can be washed and reused. Never leave your kids alone in a room with real food and baby alive. As we found out after her babysitter watched her baby alive had crackers and cheese in her. That was a interesting situation and means of removal. I wont share how I got it all out unless you really want to know. Overall A loves her new Baby Alive and so do I.